Like many kids, my son LOVES Minecraft. This year we even started a Minecraft Club at our house. It was a huge hit and the kids are asking if we are going to do it again this fall. So, when my son turned 11, we just had to do a Minecraft-themed birthday party. This year I really got my kids involved in helping with the party preparations. They had a ton of fun! This "cake block" cake was a request of my son. He thought it would be neat if we actually ate the same sort of cake they eat on the game. My plan was to make a chocolate cake with with the recipe on the back of the can of Hershey cocoa, but my son really wanted vanilla. So I went with a simple Duncan Hines box mix. We used two boxes for this cake. I poured the batter from one full box into a 9x9 square pan and baked it. I then mixed the other box and did the same. There is a layer of frosting between the two cakes. For the frosting I used buttercream frosting colored with food coloring. For the bottom layer, in addition to food coloring, I added cocoa to achieve the brown color. Check out this post for a great buttercream recipe! These are some creeper and snow golem head marshmallows on sticks. We used the rectangular s'mores marshmallows, but regular marshmallows could also be used. To achieve the green color, my son dipped marshmallows into a cup of water dyed with green food color. A tip I would recommend is to stand them up to dry by poking the sticks into a box or piece of styrofoam. They take about 10-15 minutes to dry. Ours got a little overlapped when we layered them on a plate and the color came off in a couple places. Still not too shabby! The faces were made with buttercream frosting piped on with a writing tip. I wasn't going to do any planned games this year, just let the kids have fun playing together and swimming in the pool. But my son really wanted to do at least one game. This is what he came up with. 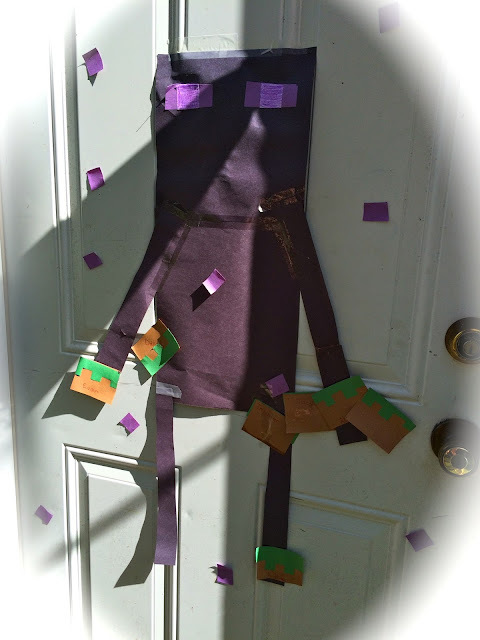 He made an Enderman out of construction paper and we made the grass blocks together. We called it Pin the Grass Block on the Enderman Hand. It's a bit of a tongue twister! The kids enjoyed it and he was very proud of himself! 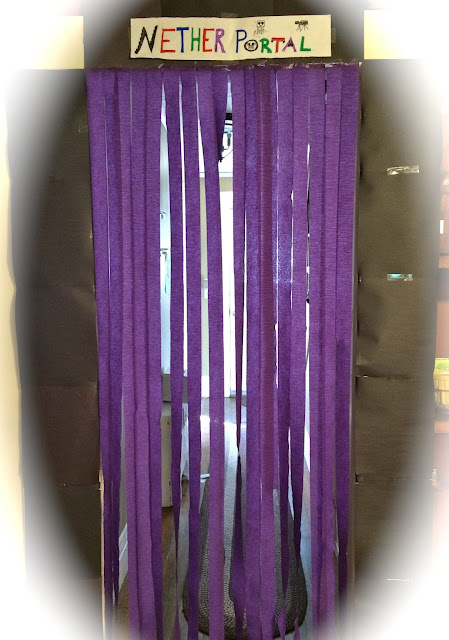 What's a Minecraft party without a Nether Portal? This was one of the kids' favorite parts. We all worked on this one together. The kids and I hung the paper around the portal, my husband drew the sign and he and the kids hung the streamers. My daughter asked for days before the party how long it would be until we could hang this up. 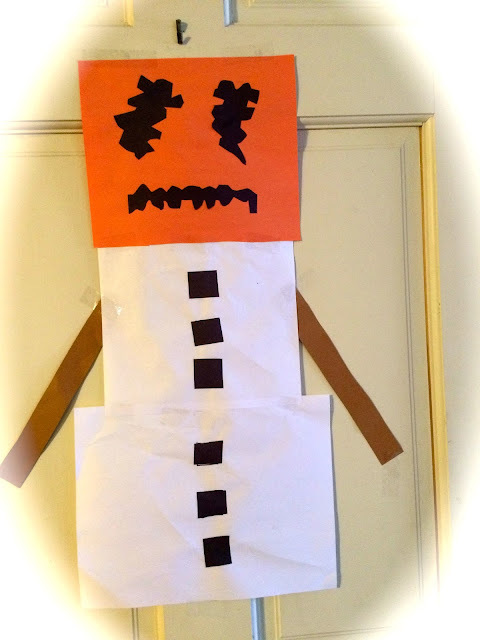 It's a Snow Golem. I'm not sure about the pumpkin head, but it's in the game so I went with it. 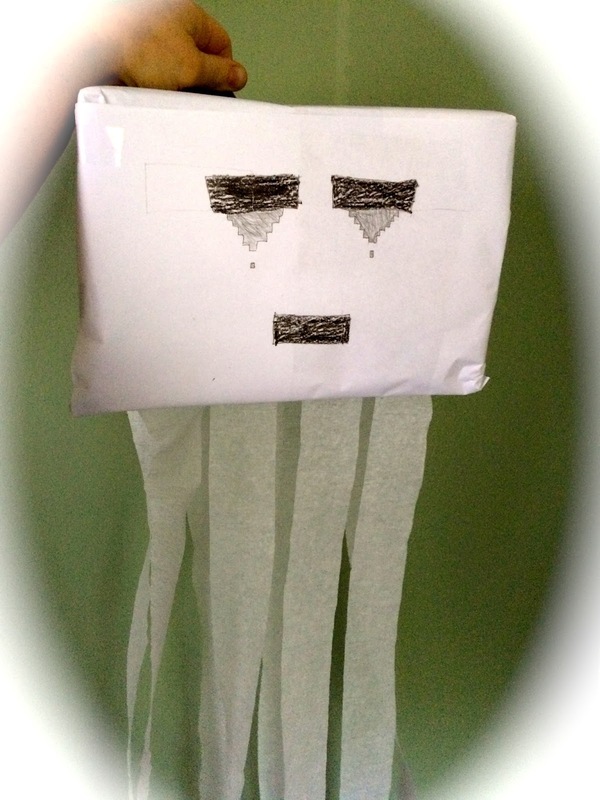 Here is a picture of the ghast my son created. We started off by covering a box with white paper and then he drew on the face and taped streamers on the bottom. It was so great to see the excitement in his eyes when we made all these things together. He was so happy! 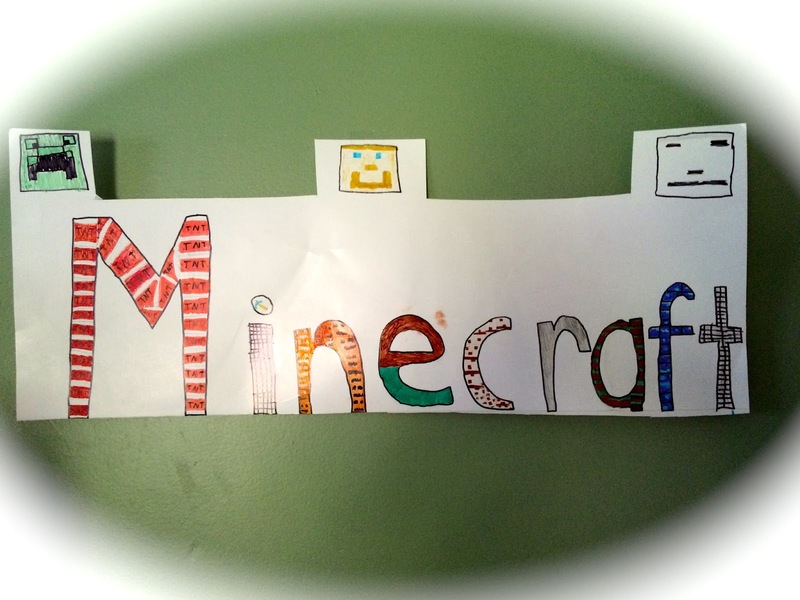 This is the sign we had from our Minecraft Club earlier this year. My son made it for the most part, but I helped him finish things up as they got tedious. He was happy that we got to re-use it for his party. So there you have it! This Minecraft party was not magazine-ready by any means, but my kids enjoyed helping out so much! I hope it gives you some ideas for your next Minecraft themed party. To see some of the places I got inspiration, check out my "Party" Pinterest page!